Filthy: A huge number of plastic bottles, tin cans, fallen trees and overgrown reeds have turned the unique ecosystem of Chadwick Lakes into an unsightly area. Chadwick Lakes has become a health hazard because of drainage pollution and a large amount of rubbish that has accumulated, according to Sylvia Haslam, an academic who has written a number of books about the site. She says the area deteriorated to a "shocking" degree in the 10 years since she wrote a field-study guide in 1998 that is still used by students visiting Chadwick Lakes on school outings. Her friend Jennifer Psaila is hoping that, with the help of the media, they will be able to organise a clean-up with volunteers who are willing to lend a hand. She shares the surname of the 19-year-old soldier who was critically injured on Friday during a military exercise at Chadwick Lakes, when he was submerged in the water for 10 minutes. The two are not related. "What is anyone doing in that lake? You should only touch that water if you have to save a life. It's too polluted for anything else. In fact, if anyone wants to help out in the clean-up they need to be equipped with Wellington boots, good gloves and fishing nets to scoop out the rubbish," Ms Psaila says. She notes that if the young man was submerged in the polluted water for long, he was bound to suffer dire consequences but so were the other soldiers and all those children who play there on weekends. Dr Haslam, who has lectured at the University of Malta and in Cambridge, explains that the drainage problem began with the urbanisation of Mtarfa. Chadwick Lakes, situated between Mtarfa and Rabat, were built on a suggestion of British engineer Osbert Chadwick, in the 1890s. 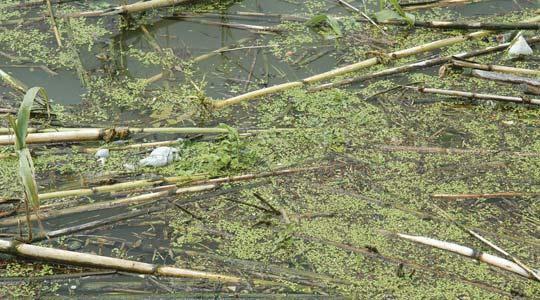 But along the decades, they became filled with sediment and rubbish, causing the water to become murky and hazardous. It also causes problems for farmers because, after it rains, the fields nearby become flooded. Dr Haslam says there are a number of diseases one can get from contact with polluted water but most commonly the symptoms would include headaches, rashes, fever and diarrhoea. While the polluted water needs to be investigated by the authorities, Ms Psaila believes the place requires a hands-on tidying exercise to remove the huge number of plastic bottles, tin cans, fallen trees and overgrown bamboo that have turned the unique ecosystem into an unsightly area. Dr Haslam feels this is not a job for the local council or the government because it needs to be led by people in the know who have "experience with nature" and who understand the complexity of such a task. However, she launches an appeal to able-bodied people to get in touch with Ms Psaila and lend a hand, adding that they would also need a lorry of sorts to transport the debris collected. If you would like to help organise a clean-up at Chadwick Lakes contact Ms Psaila on 2138 0071.